Gavin Jackson is an Officer with the Charlotte-Mecklenburg Police Department. In March 2012 Gavin was assigned full time to the CMPD Motorcycle Unit and currently operates a 2015 Harley Davidson Electra Glide Police Motorcycle. 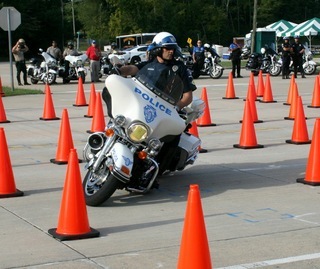 Gavin completed an 80 hour Police Motorcycle Operator Course in 2012, and has competed in two Police Motorcycle "Rodeos" placing 1st in 2014, and 2nd in 2015 for his respective skill categories. Gavin has completed over 500 hours training in Traffic Enforcement, Criminal Interdiction, and Crash Investigation/ Reconstruction. Gavin has been a Bike Safe Assessor since early 2015.